Planning to surprise your mom with some mouth-watering mid-day recipes this Mother's Day? If yes, rest assured for your search to end here. Given below are some yummy brunch recipes to prepare for your mummy. Have a look. If you like our Mother's Day brunch recipes and want to share these with your friends, you can just click here to do so. Happy Mother's Day! Corn meal - 1/3 cup. Jalapenos - 2/3 cup, canned and chopped. Corn - 1 cup, frozen and thawed/canned and drained. In a large bowl, combine all the dry ingredients. Mix milk, eggs and oil in a small bowl and pour into the large bowl. Mix with a large spoon until blended totally. Do not mix too much. Lumps are okay, though. 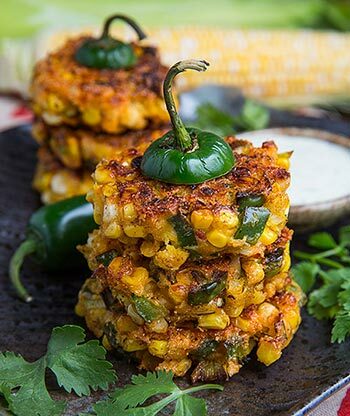 Fold in the jalapenos and corn. Heat a large, lightly oiled griddle over medium heat. After griddle is hot, pour the cakes on 1/3 cup at a time. Turn each side for 1 or 2 minutes to turn brown. If you find the cakes browning too quickly, decrease the heat a little. Place the hot cakes on a towel lined plate. Cover with an additional towel to keep them warm. Freeze if you like to serve it cold. Garnish with fresh berries, apricots or a fried egg atop. Italian bread - 8 to 9 thick slices(1 to 1 1/2 inches). Sugar - 1/2 cup, granulated. Cinnamon - 1 tsp, grounded; 1/2 teaspoon extra(not grounded). Blueberries - 1/2 to 3/4 cup, dried. Brown sugar - 1/4 cup. Grease lightly a baking dish (Size: 9x13 inch) and arrange bread slices in it. Sprinkle dried blueberries over the slices. Combine eggs, sugar, 1 teaspoon cinnamon, vanilla, and milk in a large bowl. Whisk to blend well..
Pour the egg mixture uniformly over bread. Cover and refrigerate all night. Heat oven to 325 degrees F.
Uncover the baking dish. Dust each slice of bread with a few teaspoons of brown sugar and extra 1/2 teaspoon cinnamon. Drizzle with the melted butter. Bake without cover for 50 - 55 mins, or until browned and set. 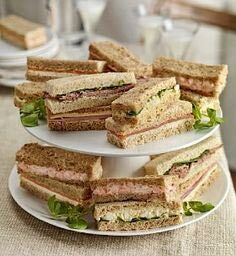 Using a sharp knife, cut around each slice of bread. Lift out with a spatula then. 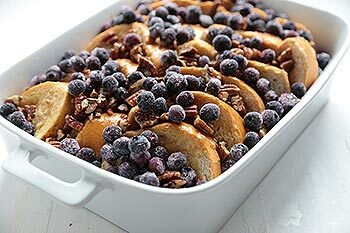 Serve with maple syrup and orange wedges (or fresh berries). You can also serve with warm spiced mixed fruit. Cream or Milk - 1 tsp. Cheddar cheese - 2 to 3 tsp, finely shredded. Green onion - 1 tsp, chopped. Tomato - 1 tsp, diced. In a small bowl/container, whip the eggs until frothy. Whisk in the cream/milk, salt, pepper and Worcestershire sauce. Melt butter in a nonstick 8-inch frying pan over low heat. Pour in egg mixture and cook slowly, lifting gently at edges to stir the uncooked egg and let it run underneath. 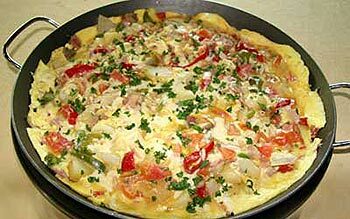 When omelet is almost cooked but still shiny on top, cover and continue cooking for about 1 to 2 minutes or until the surface dries. Garnish with the shredded cheese, tomato, and green onion; fold in half. White sandwich bread - 1 slice, cut vertically. Margarine or butter - 1 pack. Whipped cream dill/parsley - 1 to 2 tsp. Salmon - 1 slice, smoked. Lettuce leaf - 1 small, curved, light green. Mayonnaise paprika - 1 tsp. Shrimps - 6 to 8, peeled. Liver pate/mushroom paste - 2 tsp. Chicken - 2 - 3 large slices, cooked. Pimento/tomato wedges - A few, diced. Swiss cheese - 1 slice. Gorgonzola cheese - 1 small triangular piece. Radishes or olives - 2. Snip the crust and grease the bread with margarine or butter. Mark the bread in four sections. Mix the whipped cream with enough chopped dill or parsley to turn it into a pale green color. Spoon the cream over the first section. Roll up the salmon and put atop. Garnish with a nice sprig of dill. Blanket the second part with lettuce. Season the mayonnaise with paprika and put atop. Garnish with the shrimps and lemon wedge. Spread the third section with liver pate or mushroom paste. Cover with a layer of sliced chicken. Garnish with pimento or thin tomato wedges and a small parsley sprig. Cover the fourth part with the two kinds of cheese; garnish with lettuce leaves, radishes or olives and pretzel sticks.